With the proliferation of Wi-Fi hotspots and advances in mobile-phone technology, there aren't many excuses today for not being in contact with your friends, family and business associates when you travel. Using just your laptop computer and cell phone, you can stay connected from all around the globe. But not so fastdo you "really" know how to use your gadgets when traveling? And furthermore, do you have the RIGHT gadgets? Enter Global Mobile. This slim, compact guide outlines how to choose and use the gear you'll need to stay connected no matter where you're going. 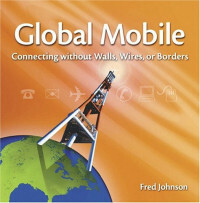 Author Fred Johnson walks you through all things wirelessfrom getting online while you sip your favorite latte at Starbucks, to swapping SIM cards in your GSM phone, to learning the ins and outs of new technologies like Bluetooth, you'll learn how simple it is to stay "plugged-in" during a business trip or an international adventure. Crammed with helpful tips on choosing services, useful charts (such as international phone numbers and GSM coverage), a helpful packing checklist, and priceless advice, this handy guide should be packed with your laptop before you leave on your next trip.